Heading to Toronto for a family visit, short stay or business trip? There are plenty of ways to spend leisure time in the bustling city. Our guide for spending a day in Toronto is filled with prime options for entertainment, dining and shopping. 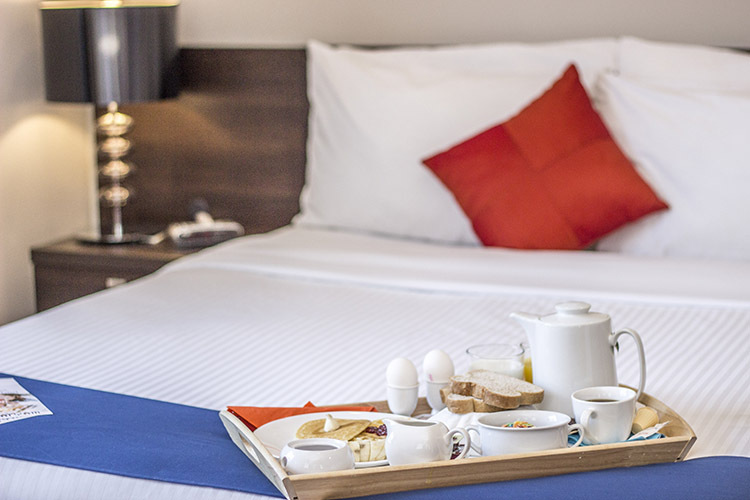 9:00 a.m. – Enjoy an in-suite continental breakfast in the comfort of your Hotel room. Sit down to a deluxe breakfast that includes bagels, toast, fresh pastries, cold cereal, juice, coffee, fresh fruit, boiled eggs and cheese. Now that you’re fuelled up, you can embark on a day of fun! 1:00 p.m. – After your shopping spree, grab lunch at Paisano’s. This Italian eatery features a large lunch menu that includes a variety of soups, salads, appetizers, pasta dishes, pizza and sandwiches. 3:00 p.m. – Take in the greenery at Parkview Park on Kingsdale Avenue. Take a stroll or jog while getting some fresh air. Later, grab an ice cream or cool treat at Cold Stone Creamery. The picturesque area in the heart of North York is full of green space and parks, so take advantage by touring the entire neighbourhood. 6:00 p.m. – Head to Milestones Grill and Bar for dinner, located at Yonge Street and Empress Walk. The restaurant’s menu includes plenty of delectable appetizers and entrees, as well as delicious desserts. Relax in the lounge area or enjoy your meal in the restaurant’s main dining room. 8:00 p.m. – Take in a live show at the Toronto Centre for the Arts – its calendar of events features plenty of shows to suit every taste. Movie buffs can unwind and catch the newest release at the Cinemax Cinemas Empress Walk theatre. After a long day, head back to your Hotel room in the North York Region – where you can get a restful sleep on your Sears-O-Pedic mattress outfitted with luxurious beddings. We invite you to learn more about our accommodations by calling 1-855-227-1699. We look forward your stay with us!